Hello and happy Friday. Ahhh, the weekend is upon us! Yesterday we took a ride out to our County Fair and walked around for a while. Lots of sights, sounds and smells! Today's card is for the Penny Black Saturday Challenge #114. This weeks challenge is to use fruit on your card. 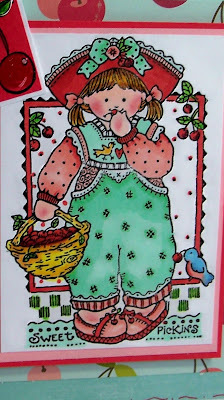 I love this little vintage stamp with the Cherry Pickins gal. I used Copic Markers to color her in. The papers are from October Afternoon. I used lace from my stash as well as the little cherry embellishments. The sentiment is a dollar stamp from Michael's. Hope you are having a great Friday and your looking forward to doing something fun over the weekend! This is really cute, Sue! 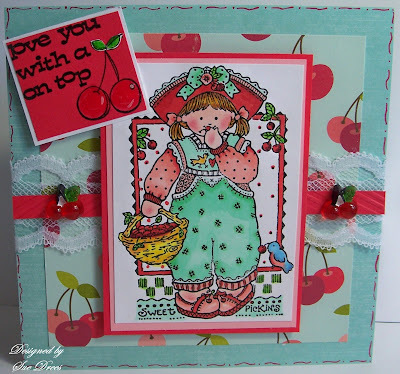 Love all of the cherries especially the embellishments! Have a great weekend! Too Sweet!!! Love the cherries, ribbon, lace and that beautifully colored image. that´s so cherrie-fresh! Love this Sue! I love anything with a cherry on top...you know me...these PB images are so adorable!